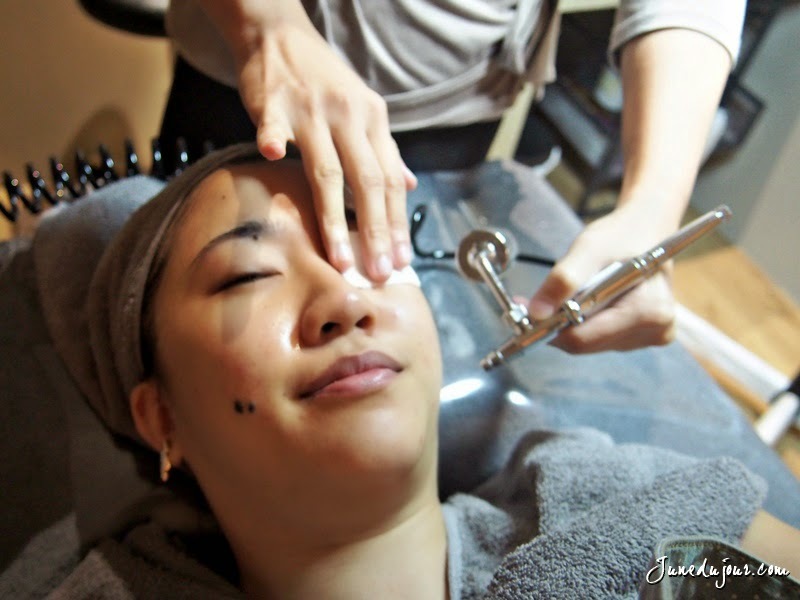 I recently had the pleasure of being invited by Hadara Aesthetics to experience their popular K-beauty inspired Hadara Lazer Glow and Hadara Power Facial. Now Hadara Aesthetics may be a new beauty spa in the neighbourhood, but this experience has proven that sometimes, great things come in small packages. Tucked in the a cosy discreet corner of the stretch of road, it is a little beauty secret for the busy executives on the go who want that perk-me-up at quick convenience, with treatments just lasting about an hour. Although small with only 2 treatment rooms, Hadara had a very chi-chi, minimalist decor that is created to be space-efficient and understated elegance. Now if you had read my earlier reviews of past, I am extremely particular about the cleanliness and ambience of a spa as I believe that it is what contributes to the whole R & R experience. Hadara does this effortlessly well, with a welcoming interior and staff's warm demeanors. The treatment started off with a cleansing and exfoliating scrub to remove all makeup and impurities. Next, she applied a skin elixir to moisturize my faces before proceeding to do a soothing massage which helps to promote lymphatic drainage, which was good as I often face water retention from my bad habit of drinking water just before sleeping. Finally we get to the Lazer Glow treatment (20-30 mins) which uses the Korean D-Light (Dual light) machine that uses SND (Smart & Dynamic) technology to photo-rejuvenate skin to achieve glow, whitening and brightening. Essentially, it is a much safer and milder version of IPL, sans the pain factor. The pulse is rather strong though, despite having solid eye-covers, I could still make out red light patches under my closed eyes. I felt no pain at all, just a delightful warmness whenever zapped. The next highlight is this little nifty thing here: the Cleopine air-spray penetration. A patented technology from Korea, you would be surprised to know that it is FDA approved as a food substance, meaning that even if you swallow any substance there is no health hazards (can't really guarantee for the taste though). The Cleopine ampoules I'm told are best recommended for sensitive skin, as it is using a special nano-technology air spray, penetrating deep into the epidermis. Its ingredients list contains fermented peptides from mushrooms, pine trees extracts, and mineral salt; which not only contains brightening, anti-aging properties, but also it helps to declog pores painlessly. I felt a thin spray of liquid over my face, like a toner water consistency which was fast absorbed to leave my skin feeling nourished and refreshed. Best part? It can be customized to specially suit your skin type and needs. After, I woke up from a nice power nap after she had applied on the mask, I was greeted with complimentary rejuvenation tea and snack goodies from Korea (which was super delish by the way). How's that for a first-rate service! BEFORE: my skin was abit lacklustre, having slackened abit since my last facial. Despite my best efforts, my skin texture looks bumpy with dark spot caused by pimple and acne scars. 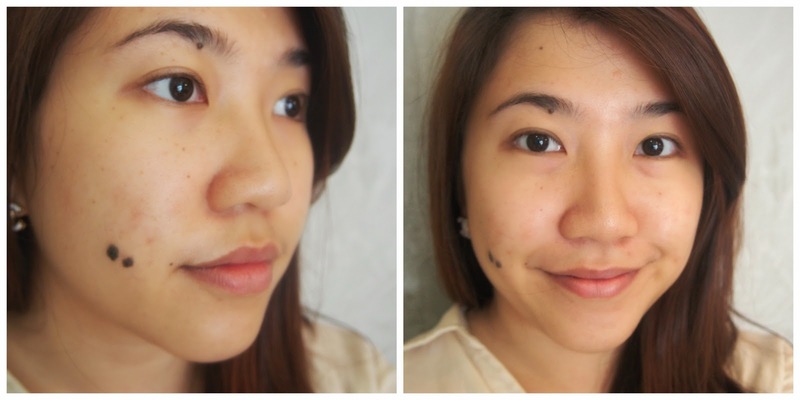 Although not very obvious, I still need concealer to really blend it away. AFTER: taken without makeup under florescent light. I am duly impressed at how the discoloration caused by my previous blemish scars have significantly diminished and my skin looks clarified and brightened than before. My pores looks much smaller, especially on the nose area. One thing I note is how more supple my complexion is such that it can take my makeup better. In case you were wondering, Hadara Aesthetics used their in-house specially formulated skincare range called Dermagold during the treatment. Below are the exact combination of items used; do look out for my next post as I review their Miracle C+ serum and Skin Elixir! Thank you Hadara Aesthics and the gorgeous co-founder YY for letting a truly top-notch spa experience! Truly one of the best I had ever had and one that I would be happy to go back for again. Hadara Aesthetics is located at 21 Lor Telok, #01-01, Singapore 049035. Book your appointment today by calling +65 6969 3022 or drop them an email at info@hadaraaesthetics.com. Check out more goodness here on at www.hadaraaesthetics.com or follow them on Facebook page here for latest updates and promotions. Stay beautiful, everyone! wana follow each other via GFC and facebook?